It may seem like the easiest option to get your mortgage and conveyancing solicitor from the estate agent from whom you are buying your house, but there are downsides. We take a look at why this may not be the best option and set out what to do if you’re feeling strong-armed into using an agent’s in-house services. Are estate agents’ in-house services too good to be true? After months of searching, you’ve found the house of your dreams and now you want to get things moving. Luckily for you, the estate agent selling said house is on hand to offer not only an adviser to sort your mortgage, but also a conveyancing solicitor to undertake all your legal work. But beware. For all the convenience of using a broker or solicitor tied to the agent marketing the house you want to buy, there are plenty of downsides. The Financial Conduct Authority – the City watchdog – is so concerned about the way estate agents are offering in-house services like mortgage brokers – and the implications of this for consumers – that it has vowed to launch a formal investigation into the practise. We take a look at why you should avoid estate agents’ in-house services. In order for a mortgage broker to find the best possible mortgage for you, they need to be able to access as wide a range of products as possible. Brokers who can do this are known as ‘whole of market brokers’. However, not all brokers are. Some can only access mortgages from a limited panel of lenders. This is often the case with in-house advisers at estate agents. This means you might not get the best deal and end up paying more for your mortgage. So always shop around. The same goes for estate agent-recommended conveyancing solicitors. They are often more expensive than you could get by ‘shopping around’ for solicitor quotes because they are often paying a referral fee – which may be added to your bill – and are less competitive in price because they have a ‘captive’ market (you!). Ask if there is a referral fee, and ask how much it is. When you are selling a property, the agent will often offer a discounted package if you use their chosen solicitor. This can seem like an attractive offer but you should ask for a full written quote from the solicitor firm (including any possible extras) before accepting. All solicitors must give you independent, impartial advice but you may be asked to waive your right to privacy between you and your estate agent if you accept one of these packages. This means that your solicitor is free to report to the estate agent exactly what is happening in your sale. If the person buying your house should pull out of the sale, for example, you’ll probably not want to tell the seller of the house you’re buying straight away, in the hope you can find another buyer quickly and keep the sale together. If you’re using the conveyancing solicitors attached to the seller’s agent keeping this information quiet could be tricky! Bear with us on this one. No one is suggesting your need to be all cloak and dagger when it comes to your finances. Indeed, it’s important to be upfront and honest about what you can afford and what you’re willing to pay. However, if the estate agent marketing a house – for the seller (let’s remember whose side they are on!) – persuades you to let their in-house adviser vet your finances, the agent will have a clear idea about what you can afford and may encourage the seller to push for a higher offer. Once the agent knows what you’re able to pay (rather than what you’re willing to pay), your negotiating position is completely undermined. The agent may try and justify this by saying they need proof of funds in order to progress your offer – but even then you only have to show how much you have available, the agent does not need to know the ins and outs of your finances. Find out more with our guide to proof of funds. 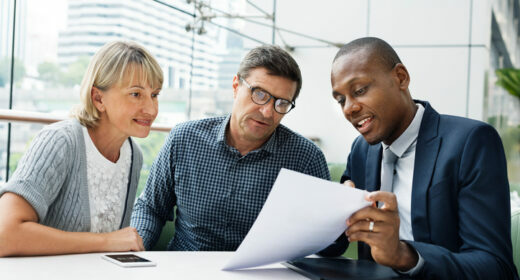 The financial adviser or broker should work for you, the agent should work for the seller – it makes sense, therefore, that they should be kept apart. In some areas a seller’s market, characterised by a shortage of marketed homes, demand is high and the marketplace competitive. Agents are also under pressure to earn more from add-on services such as mortgages and conveyancing, as well as their traditional source of income from the sellers fees. Presumably as a result of this pressure, there have then been cases of agents implying that you will receive preferential treatment if you use their partner solicitor or mortgage broker. When you are buying a property, particularly if it’s your first home, you may feel pressured to keep the estate agent ‘sweet’ by using their preferred solicitor or mortgage broker in order to ensure that you secure your property. Particularly brazen agents may imply that you won’t be allowed to view certain properties or that your offer will not be passed on to the seller if you’re not willing to speak with the in-house financial adviser. This is an illegal practise – the Estate Agents’ Act 1979 dictates that all offers must be referred to the seller – so always make sure you challenge any agent who tells you this. Both the SRA and the CLC rigorously state that its members are meant to ensure that their client has chosen them to act without pressure being exerted upon them to do so. If you are being pressurised into choosing a solicitor as outlined above refuse firmly and advise that you will seek the advice of the SRA or CLC – this usually does the trick! Find out more about resolving agent disputes and remember to let us know if you’re having problems. We’d love to help and your story can help strengthen our campaign to put an end to putting pressure on buyers to use in house services. There is certain regulation in place which prevents estate agents from discriminating against a buyer because they won’t use in-house services. Sadly a number of agents choose to ignore them but they do so on the hope that customers won’t pick up on it.The best way to protect yourself is to know the law. According to the National Trading Standards Estate Agency Team of Powys County Council, which is lead enforcement authority for the Estate Agents Act 1979, agents “must not discriminate against potential buyers because they don’t want, or might refuse, to take services from you or a connected person.” This means agents must not “refuse to provide information about a property to these buyers, take longer to send property information to these buyers, compared to others or set additional requirements, as a condition of passing on an offer.” Arm yourself with this information. If you think the estate agent is discriminating against you because you’re not using their in-house services it could be worth contacting the seller to let them know. Sellers want to feel confident that their agent is marketing their property far and wide, not restricting the number of viewings they get. If they find the agent is not acting in their best interests they’re not likely to be happy. Feel you’re not being heard? Unless your agent outright refuses to pass on your offer, it can be difficult to prove that they are treating you differently because you won’t take them up on their offer of using their partnered firm of mortgage broker or conveyancing. Recording your conversation with the agent is a good way of obtaining proof that they’re behaving incorrectly and may make your complaints more powerful. Do estate agents need proof of funds? Our message here is that consumers should never feel under pressure and obligated to use estate agent in house services. Consumers should shop around and be careful what they buy from an estate agent who has a vested interest in knowing about their financial situation and their legal transaction. As for our services, yes we make a referral fee from most tools we offer on our site. We have partnered with organisations that give consumers choice, allow them to compare quotes and find the best deal. So for example, our conveyancing service connects consumers to a panel of over 150 regulated firms, our mortgage advice partner London and Country connect consumers to over 80 lenders and give fee free advice and our surveying tool connects consumers with local surveyors so they can compare quotes and decide to use them or not. I hope that helps. This article seems a little hypocritical. What referral fees you (HOA) being paid for: conveyancing? mortgages? surveys?